Many of these girls are on staff here at the pool and some of them are currently taking the lifeguard class this semester as an elective class and want to work here. This year marks only the sixth season of girls swim team for Foster High School. Ever. We think… (We’ve gone back through easily available records and asked around via word of mouth). This fact may surprise some since the pool is a mere 100 yards away from the high school. Thanks to the hard work and dedication of the athletes the program is steadily growing. Up until three seasons ago there was no Bulldog representation at the league swim meet — the event that serves as a culmination to the scheduled dual meet season. Two seasons ago four girls swam. Last season eight girls swam and one qualified for the district meet in two events — districts is the next level of qualifying and is followed by the state swim meet. This season 12 girls swam during the regular season, 10 were able to swim at the league meet and eight girls traveled to the district meet to compete in three events. This is quite an accomplishment because they must reach faster and faster time standards to qualify for district and state competitions. Those are the numbers and the facts. Now for the stories. The first few years of swim team coaches allowed anyone who wanted to try out to be on the team. As a result, a number of girls who literally had no idea how to swim at the beginning of the season were swimming multiple events by the end of the year. 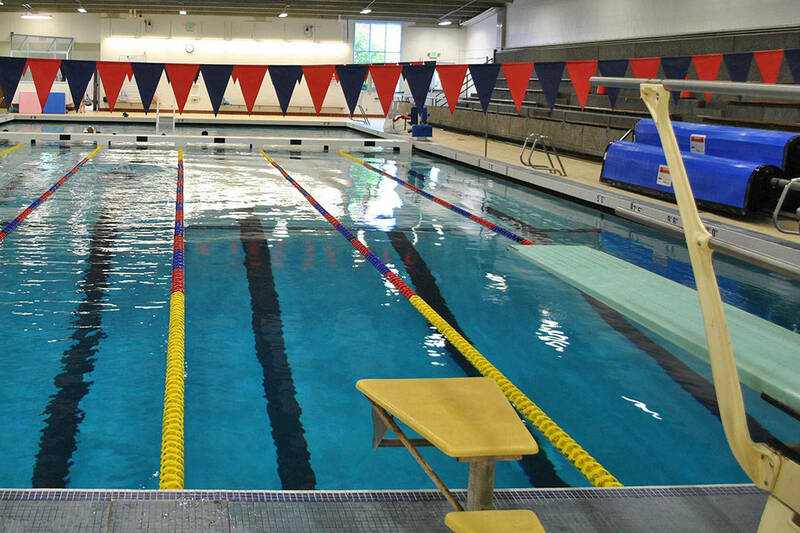 Now that a swim class if offered as part of the Foster High PE program, the coaches require that someone trying out for the team must be able to swim 25 yards without touching the side to stop. We had a few girls turn out this year who were at that level and it was great to see them improve. Our team motto is “Be the shark” and it actually means that together we can accomplish amazing things. This comes from a poster that shows a school of fish in the shape of a shark with a Maya Angelou quote, “The sum is greater than all our parts.” Every girl contributes to the success of each individual on the team and to the team itself. This is absolutely evident during the day in, day out workouts and during the swim meets when racing other teams. • Team captain for 2017 and 2018 seasons. As a child growing up in Tukwila, she took swim lessons at the Tukwila Pool, but she never swam competitively. As a freshman she turned out to swim because a friend convinced her. She ended up swimming all four years and, among other fantastic accomplishments, dropped over 40 seconds off of her 100 freestyle time. The only Bulldog swimmer to swim competitively prior to being on the high school team, Tabitha has lofty goals and has already begun taking strides to race at the State Swim Meet by the time she’s a senior. She burst onto the Bulldog swim scene as a freshman swimmer by qualifying for Districts in both the 50 freestyle (the most competitive race by sheer number of swimmers) and the 100 backstroke. She repeated again this year in both those events and set personal records (PRs) at the District meet, qualifying for the second day of competition in the 50 free. New to the team this year, Valentina jumped right in as a team member and sent a message that she was here to improve. A family trip to her home country caused her to begin the season a little late, but she quickly started dropping chunks of time off of her 100 and 200 freestyle times. By the end of the season she’d raced herself onto the 400 yard Freestyle Relay team. Time for a new goal: Qualify for Districts in the 400 yard Freestyle Relay. At the league meet the following week they swam a 4:46.51. Almost five seconds faster. Then came the District Swim Meet a week later… the girls pulled out all the stops with each swimmer reaching personal best times in their 100 yard leg of the race. Their time was 4:36.87… If you would have been there you’d have thought we won the gold medal. The four girls there as alternates were jumping around, hugging the tired relay swimmers and high fiving each other. It was a true “Be the Shark” moment! The Bulldogs girls swim team was selected by a vote of league swim coaches as the 2018 SPSL 2A Sportsmanship winner for the second season in a row.